VGN2KS is a wired NMEA 2000 interface adapter for Remote sensor units that allows connection of serial ports to the NMEA 2000 bus. The device plugs into serial port and delivers real-time sensor data over the NMEA 2000 network to multiple display heads. 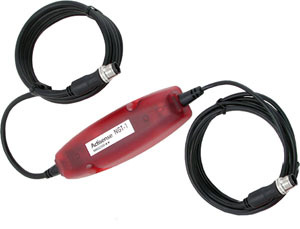 The adapter works with our vDash application on Windows PC to enable real-time display and data logging from any Remote sensor units over the NMEA 2000 Bus. VGN2KS allows you to use our Remote Sensor interface unit as a bridge between analog sensor data and digital displays on the NMEA 2000 Network. The 16 possible analog inputs are calibrated via downloadable sensor tables to allow for a virtually unlimited combination of instrumentation choices. A single unit can support op to three engines with RPM, Fuel Flow, Temp, OIL Pressure, Battery Voltage, and Fuel levels. Once on the NMEA 2000 Network, all data can be viewed from multiple locations with compatible, chart plotters/sonar units. VGN2KS comes with cables for direct connection between the Remote Sensor unit and NMEA 2000 bus using standard Device Net terminations. VGENET plugs into Remote serial port and delivers real-time sensor data over wired Ethernet up to 300 feet. When connected to a Internet router, remote control is possible just about anywhere in the world. The adapter works with vDash application on Windows PC to enable real-time display and data logging. VGENET comes with a full function Web Server that can store up to 1.2 MB of pages and supports JAVA Applets. These features allow SeaGauge-Remote to be deployed as a Web-based remote sensor accessed via any Internet Browser to display real-time data. Offering support for a full set of networking protocols, VGENET is easy to set up and manage with supplied configuration software. Simple DHCP management of IP addresses and Telnet login round out the feature set. VGWIFI plugs into Remote serial port delivering real-time sensor data over wireless Ethernet up to 300 feet. When connected to a Internet router, remote control is possible just about anywhere in the world. The adapter works with vDash application on Windows PC to enable real-time display and data logging. VGBT is a wireless interface adapter for Remote sensor units. It allows connection of Serial master port to Bluetooth radio. This adaptor plugs into USB port and delivers real-time sensor data over wireless Bluetooth up 300 feet. The adapter works with vDash application on Windows PC to enable real-time display and data logging. VGBT allows you to use Remote serial ports for both Display Heads, and Host PC connections. Built-in electronics translate and regenerate serial signals so they can be used by Bluetooth enabled devices such as Laptops, PDAs. and Cell Phones.